As Jonathan Franzen's new book, Purity, gets closer to release, talk about the author has picked up speed. 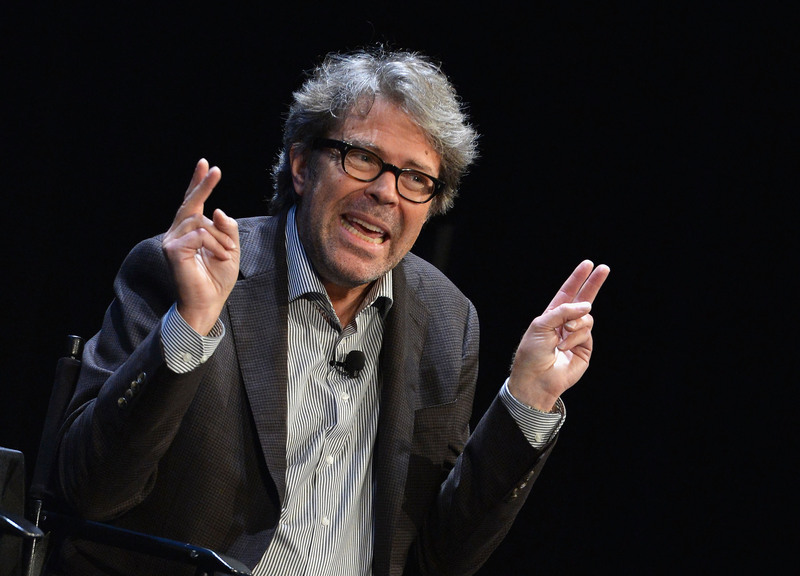 One question that keeps coming up repeatedly is: Is Jonathan Franzen sexist? Oh, if only there were a cut and dried answer to this. Franzen is a controversial figure in contemporary literature, beloved by many critics and hated by many readers. Franzenites have, at times, ignored the writer's more questionable comments, while he's given his detractors more than enough ammunition against him. But is he actually sexist? Misogyny seems to follow him like a cloud; even if you don't know about his exploits, you catch a whiff of them when he passes by. That cloud isn't an uncommon quality among the male postmodernists of the last 20 years or so. Remember when Bret Easton Ellis suggested that the 2000 film adaptation of his novel, American Psycho , couldn't possibly be good because it was directed by a woman? Even the Kurt Cobain of Gen-X literature, David Foster Wallace, was known to spew sexism from time to time. Like so many people, I don't know Franzen personally, so I can only judge him by the things he says in public. Here are five of his most controversial comments, so you can determine whether or not you think he might be harboring some sexist prejudices. Back in 2001, Franzen's third novel, The Corrections, was all anyone could talk about. Oprah, thinking it was a pretty good book, picked it for her famous Book Club. Speaking about it to Powell's Book Club, Franzen said, "She's picked some good books, but she's picked enough schmaltzy, one-dimensional ones that I cringe, myself, even though I think she's really smart and she's really fighting the good fight." Two things never seemed to occur to Franzen: 1) that his book could very well be just as "schmaltzy" as Oprah's other picks, and 2) that maybe insulting the person who is going to expose you to millions of viewers all around the country isn't the best career move. Oprah, for her part, tactfully rescinded her offer to have Franzen on the show. Edith Newbold Jones did have one potentially redeeming disadvantage: she wasn’t pretty. ... After two failed youthful courtships, she settled for an affable dud of modest means, Teddy Wharton. That their ensuing twenty-eight years of marriage were almost entirely sexless was perhaps less a function of her looks than of her sexual ignorance, the blame for which she laid squarely on her mother. As Franzen contrasts Wharton's female protagonists — all beautiful — with the author herself, he arrives at the conclusion that her lack of physical attractiveness may have contributed to Wharton's abilities as a writer. Despite all her privileges, despite her strenuous socializing, she remained an isolate and a misfit, which is to say, a born writer. ... As if aware of what an unlikable figure she herself cut, she placed unlikable women in the foreground of these novels and then deployed the storyteller’s most potent weapon, the contagiousness of fictional desire, to create sympathy for them. Evidently, for Franzen, pretty women have a much more difficult time writing than those he pronounces ugly. The 2013 VIDA Count (which examines how many male-authored books versus female-authored books get covered in literary publications) was pretty damn depressing, and Frank Bruni of The New York Times felt compelled to write about the pervasive sexism in the literary community. He quotes a Salon article from Laura Miller, saying "There’s a grandiose self-presentation, a swagger, that goes along with advancing your book as a Great American Novel that many women find impossible or silly." Apparently feeling called out, Franzen replied, saying that, yes, while there might be gender imbalances in literature, women were writers, editors, publishers, and reviewers, so there couldn't possibly be any real sexism in the community. Sealing everything with a big no-homo kiss, Franzen notes, "The world most glaringly dominated by male sexism is one that Mr. Bruni neglects to mention: New York City theater." Given that Frank Bruni is gay, Franzen's words can't come across as anything more or less than a tasteless gay joke. And it would all be reactionary, except for the fact that we all know Franzen is far too dignified to put out a piece of writing without perfecting it first. So, his perfect response... is a bad gay joke. Back in 2010, Jennifer Weiner and Jodi Picoult wrote about the level of attention and praise Franzen's novel Freedom garnered, questioning whether a book by a woman could possibly receive the same in the boys' club. This evidently warranted a half-decade long feud that has yet to resolve. According to Franzen, there is a gender imbalance in the literary community, but only in the canon: those hallowed halls that only serious writers — like Franzen himself — may enter. Weiner, he says, is "freeloading" on that bias in order to gain attention for her own "formulaic fiction," which will never get the same attention as his own work because it just isn't good. Of course, he hasn't read it, but no one ever told him to, and that's evidence enough for Mr. Franzen. 2015: Franzen's Purity Has A Potential Feminist Problem, Explained Away As "Satire"
Not too long ago, I wrote briefly about Franzen's upcoming novel, Purity , which has a "feminist" character named Anabel Laird. Anabel makes her male partner, Tom, urinate sitting down because it's unfair to her that he can stand to pee. Damn feminists, wanting to make emasculate those penismen, amirite? Franzen has written a woman ... with the potential to be both [batshit and funny] (rich and ashamed of her wealth; a militant feminist obsessed with her body; dependent on her partner, Tom, and unbearably cruel to him). That she turns out to be neither is perhaps because her story ... is not her own. It is Tom’s. And so what we read, in the section of the novel given over to his memoir of their marriage, is a collection of grievances which gives much insight into Tom, long suffering codependent, and little into the fantastically interesting but eternally obscure woman who gives birth to Purity — and then has few opportunities to speak in the book to which her daughter lends her name. Franzenites excuse Purity as a work of satire, but that's an easy cop-out in these postmodern times. It's also an insult to Mr. Franzen, who has had no problem telling us how he feels for the last decade and a half.